The other day, whilst riding my bike in London I came across a surprising sight. A man had collapsed in the road with his head towards the oncoming cars and his legs extended towards the pavement. It was a bright day, cars and people were passing him by constantly yet no-one stopped. Disgusting. I backed up my bike, called an ambulance and tried to speak to the man on the floor until they arrived. Apparently, in London a couple days ago a similar scenario happened where a man collapsed (can't verify if the collapse was genuine or not) but still, nobody came to his aid. This took place at a busy, safe and well lit underground train station. People just continued on their journey, some even stepping over him. How were they to know if he was faking it or not? What threat could he have posed? What would they have risked just to ask this man if he was OK? During the Nazi era, hundreds of innocent people put their lives on the line by helping to hide Jews in order to stop them from being killed. Most of you may remember the story of Ann Frank, who was hidden for many years under the protection of dutch citizens in occupied Holland. How about Oscar Schindler, who also protected many Jews during this time at a great personal risk. There are many more high profile examples from different places and periods in history where people risked everything just to help strangers. Today, we can't even break our stride for 2 mins to get help for someone, even with no risk involved! What would it take for you to stop and enquire if someone is lying on the floor or who has just collapsed? I can understand if you are on a dark street late at night in a dodgy neighbourhood but that doesn't stop you from calling the police/ambulance for help, does it? What in the world has happened to the mentality of people today? What do you expect would happen if you fell ill on the streets? If you have ever walked past a collapsed person, what was the reason why you didn't you stop? I'd love to hear your views, comments and opinions on any of this. It's horrible to imagine that people could be so callous as to step over someone who's obviously not sleeping! I feel a certain obligation to stop and help someone who's fallen out, and i would hope that they'd stop to assist me if I was found down. In the USA, there are Good Samaritan laws that exempt bystanders who stop to assist from future litigation...those laws were specifically designed to reduce one's hesitation to provide assistance by guaranteeing that they won't be sued. I think the French go a step further. I found this out in the aftermath of the death of Diana, Princess of Wales. Apparently some people at the scene of the crash potentially faced prison for their failure to give due assistance because of the law in that country. I have to say I find the idea of suing someone who has stopped to help absurd and perverse. Helena. I can't believe that there would have to be a law to exempt a bystander from helping, it sounds really crazy. I understand that damage may be done if you move someone that shouldn't have been moved but to sue someone for helping is madness to me, especially if they really believed they were helping. I'm not surprised then, why some people don't get involved. Due to your profession we'd all be very glad for you to stop and help, people like you save lives :) Thanks Helena. I haven't experienced this kind of situation myself, that I can think of, but I did hear one story that a friend of mine told me. There was a woman making a rukus outside a supermarket and asking people for help. She was staggering around and her speech was slurred. People were ducking a diving to avoid her. They seemed to be assuming because of her behaviour and attire that she was probably drunk or on drugs. They didn't want the bother. My friend just asked if she was alright. She seemed to want an ambulance so my friend called one. When the amublance turned up they immediately recognised her as being a dibatetic having a hypoglycemic attack and had to quickly treat her as the condition can be serious, even life threatening. Apparently this can make people appear drunk and sometimes behave rowdy or combatively. I shudder to think how things might have turned out if my friend hadn't taken the 'risk' of approaching her. I'd like to think I would do the same. These are the kind of stories that always makes me think when you see someone on the ground or in distress. There is a 50/50 chance that the person could be seriously ill, and if you are wrong, there's nothing to stop you from resuming your walk. That's a brilliant example Navigator, so thanks. Most of the disinterest with helping people comes from two or three reasons. The paperwork alone in getting involved...omg, people have their own lives to get to, and their own deadlines and don't want to be caught up all day answering questions and giving statements. Another is people thinking that they might be doing it because they want to, and if someone intervenes, they'll get yelled at. Happens all the time. And then you have what other people mention here, that there had to be laws enacted in the US just to protect people who tried to help from getting sued by the people they helped. *shrug* That's the world we live in now. Though I still remember the story of a guy I worked with. He lived next to a youth penitentiary, and there were escapees all the time. One time, they went outside to find a young teen hiding in their dog house, eating the dog food. They took him out a meal, and didn't tell the cops about him. Several years later, they started receiving post cards from the young man, telling them he was doing well, and thanking them for what they did. Its always a risk, helping someone, but sometimes, just maybe, you can make a difference in someone's life, and they'll honestly be grateful. Yep, I've heard the one where people don't want to get caught up in all the questioning from the ambulance or police especially if it happens to be very serious. My question to them would only be, if this happened to their loved one, would they expect someone to stop and help them and be prepared to give a statement? I'm so sure they would agree. Cor blimey Dan. Harbouring a felon! I wonder what crime he/she committed, but there again, it couldn't have been that serious if they had escapees all the time. Whatever the deal, it was a gesture of goodwill that led that young person to send postcards, and that doesn't sound like someone who is still in the same mindset - unless they are keeping their options open to be hid and fed again (joke). For me, I always will weigh up the cost of taking any risk, and then decide if it's worth it. Thanks Dan. I have never been in such a situation. I think people just don't feel responsible, they think that someone else will help. Actually that is even a crime, in German its legal name is "unterlassene Hilfeleistung", I looked for a translation and it says "non-assistance of a person in danger". I am not sure whether that is the same. Anyway, what I am trying to say is that people should really help and actually even have to. I do understand that people are afraid to be in danger when they are alone in a dark street for example, but there is no danger in calling the police or ambulance, as you said. Yes, it should be a crime if people don't actually do anything. Just a simple call for help is the least that is expected of any human being. And if a phone is not available, then a shout for help, knocking on a door or running into a shop is all good, but they should be required to do something, or fully explain their reasons for not taking any action. Thanks Kleopatra. It amazes me how uncaring some people are nowadays. I have seen the same thing here in NYC. Not all people are like that as many here are willing to help, or at least call for help. I have had similar situations and offer assistance. Remember people, that might be you on the ground one day. A little caring goes a long way. Well said Phil. It could be any one of us needing that help any day. So we should really treat others as we want to be treated. Thanks for your comment Phil. I'd like to think I would stop, but London does that to you, I'm afraid. Oh Robert, as an encouragement, just think of how easy it would be for you to get someone relaxed with your funny sense of humor whilst waiting for the ambulance or police to arrive. I do read you blog Robert. I live in Florida. There are so many scams here. People jump in front of your car and pretend to be hurt, then scam your insurance company. My telephone receives several scams every day; people pretending to be associated with your credit card company or bank to get your personal ID. Some call for donations for Firemen or Highway Patrol; even have fancy stationery to mail you. Turns out, some of those are frauds. Who do you trust? Now there's a thought Carol. I've heard about these scams of people pretending to be ill and then robbing you, and about the fake car crashes in order to get insurance money from you. That's truly appalling, and I guess it can make you think twice before you stop and help especially if you have been a victim of these scams. I watched a TV program some time ago that stated the USA was one of the most gullible countries for internet scams because they were people more willing to give rather than check out the info. Good and bad. The TV program tracked a group of people in Africa who used an internet cafe all day long just to send emails asking for donations, etc from the Americans. Later on, they were arrested only to be replaced by another group. It's sickening when you see this abuse of goodwill. Thanks Carol. I am sure there are a number of reasons why people are more reluctant to get involved these days. For instance, some people may care but are genuinely concerned about their personal safety. Also, with social networks like Facebook, people claim to have lots of friends but these are very impersonal relationships formed by a click of the mouse. Then there are many people out their who are intent on exploiting the kindness of others. Through it all, we have become a less neighborly society. You do have a point Frank. Personal safety is an issue, and I would admit that the least I would do is call for help if I felt threatened by a situation or thought I would not be able to defend myself should the need arise. Exploiting others is something that is happening more and more, especially on social websites where the information can't always be verified and you just never know who is on the other side of a computer. Some people run businesses that way, where nothing is done honestly. Thanks Frank. How sad. I would like to think that when I need help (and the day WILL come) that I will get what I need. I think of those under-age boys in the last world war who lied about their age to fight for people they didn't even know - would that really happen nowadays? We seem to be getting so far removed from a sense of global community - rather ironic, considering the global nature of our modern communications, isn't it?? I can't even imagine the youth of today lying about their age just to get fighting in a war. Times have really changed. Let's hope that we never get into a bad situation where we need help from a bystander but no guarantees. Thanks Melody. This is a terrible thing. I've heard of this here too. Just leave the person there and go on about your business. I honestly don't know how anyone can do this. Shocking but true Donna. Thanks for your comment. I'm surprised no one has explicitly mentioned the bystander effect. It's an actual documented behavioral phenomenon. If something happens in a public place, people will assume that "someone else will take care of it." If you find yourself in a situation where people may be falling victim to the bystander effect, the best approach is to single someone out to come help. By pointing at someone and saying "you, please help" as opposed to "someone help," you make it harder for someone to shrug something off. In the case you mentioned, it is possible that safety and legal concerns may also come into play. But there are also simpler situations where people will not help just because they think someone else will jump in at any moment. I've not heard about this bystander effect behavioral phenomenon, but I have seen what you are saying in action. I'll be more alert if I come across this again. Neel, thanks for that important tip and your comments. People (hopefully not me) assume that someone else will take care of it. London is such an ethnically diverse place these days that people fear retribution if they help others. It's very sad, and what's sadder is that I believe it's inevitable. It must be that bystander effect that Neel Joshi spoke of, or maybe people just don't care anymore. Either way, as long as we play our part, that's all we can do. Thanks Roger. Of course it's outrageous, and I hate bystanders, they should be ashamed of themselves in cases like this one. In rest, I have nothing else to say other than what has been already said. Yes Gabriel, I'm afraid that's how society seems to be going sometimes. As long as we all take a stand to try to do the minimum, it could save someones life. Thanks Gabriel. Unfortunately RumPunch, we live in a world full of apathy. How many times have we heard/seen crimes when a person was being assaulted or beaten, robbed, and no one intervened , came to their assistance, or even bothered to call the police? So sad, but true. I always try to put myself in other's situations, so my rule of thumb is to treat people as I want to be treated, because in every given situation, it can be said: "there but for the grace of God go I!" That's the key Nell. Treating others how we want to be treated. I've got a topic for the future called 'There but for the grace of God go I', so I smiled when you mentioned it. Thanks for your comment Nell. Well bravo to you for stopping and calling for help!! I always try to see the good in people, and would think I would try to help if possible. A woman in a big city, however, is a target and we have to be careful. Walk tall, be tall and appear unafraid. This is a world where we can't be too careful. This is also a view that I will agree is a bit sad. I was in Chicago over the weekend. I do so love city life....the hustle and bustle, the mass of people around me, the sounds of the city. But I am aware that danger is around every corner. It is a cynical world. Again, bravo for you for rising above the fear and giving assistance. Quite admirable. Michelle, I am the first to say that you must do a quick risk assessment with everything these days. Don't ever just dive in otherwise you may find yourself in more trouble than you thought, women especially, so I agree with you. I must admit that I love the hustle and bustle too. Guess in big countries and cities people don't help for the reason that you might get involved in a lot of questions of all sorts! over here its different thanks God for that!! most probably the mentioned gentleman would not have been able to even hit the ground it if have happened over here!! One episode I remember in one of my trips to London is the day I got completely lost (it might have been my un-experience with riding the tube or due to closed tube stations!!) anyway.....well people avoided me asking for directions even tough they knew I was a lost "tourist" the only person that stopped to give me a help was a woman that later while walking and offered to share her umbrella with me ...well discovered that she was from my country!! well thanks for this post and well done for helping the gentleman out by calling an ambulance !! I won't pretend this sort of thing doesn't happen in London as similar things have happened to me. If I'm stopped by a tourist for directions I always tell them afterwards it would be a better idea if they stopped someone official ie: policeman, traffic warden, tube worker etc as you are more likely to get better help and/or directions, and you won't be ignored. Thanks for your comments Hotei. I've been in several similar situations and have always offered assistance of some kind-first asking the person if they need help and then calling an ambulance if they do. It's hard to imagine that sort of neglect or callousness in the small town where I live now, but I saw a great deal of it growing up in NYC. People are just too busy and hardened there and too afraid to get involved. I guess that's the beauty of living in a small town, people are more likely to know their neighbors and less likely to ignore something like this happening on their door-steps without taking action. Thanks NP for your comment. This is so sad and speaks volumes about our society. I think a lot of people nowadays are afraid to get involved in anything after being burned by acts of kindness. Trust is gone, replaced by fear. I would be distraught if I saw someone lying in the street like that. I get terribly upset even when I see an animal in the street! I most certainly would try to get help. I'm so glad you stopped to helped this person, and I pray that they are okay! Thanks Menopausal mama. I think in England we seem to love our pets more than people. The amount of times I've seen the fire brigade trying to rescue a cat out of the tree/building etc tells me I'm not wrong. Thanks for your comment My Froley. I didn't realise that the metro had a 'thanks' section, that's very encouraging because most papers bring bad or mad news, so it is nice to know there are some nice people out there too. Yes, it was a surreal moment for me because you could definitely see someone was lying in the road and even when I stopped to help, everyone was still going past us as if nothing was happening. Strange. 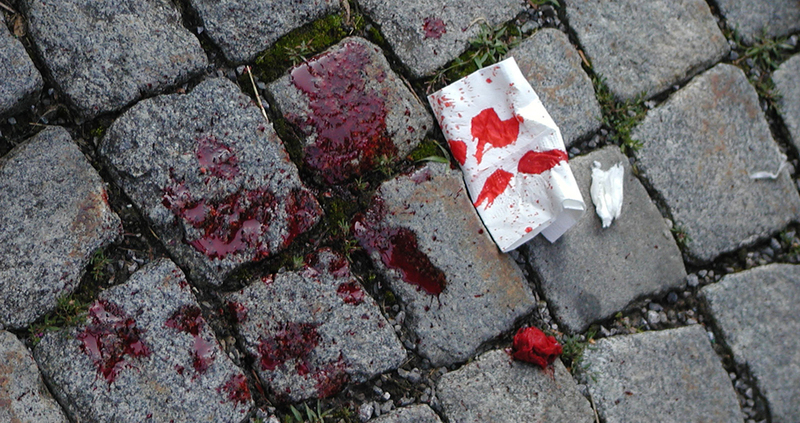 I can obviously only speak about where I live but I remember once an incident where an elderly man fell on some steps in the town centre and cut his head - it obviously wasn't a really bad wound but head wounds bleed a lot! Two people instantly came to his aid. One sat with him and held some tissues to his head and the other called an ambulance. I didn't stop to help but that's only because he had all the help he needed. At least you could see that he was clearly getting the help from the other 2 people and wasn't being neglected. In a case like that, we all then don't need to stop and gather round the person. Thanks for your comment Jade. Things are the same way here in the U.S. these days. I don't know what it is... It's heartbreaking is what it is. Do people really live in so much fear these days that they are too afraid of being mugged, or worse. I don't think so, you can dial a cell phone from a long way away. I have been in some pretty rough places in my life, I'm probably a little more paranoid than most too. And I don't live in that kind of fear. I could never walk by someone who appears to be in critical need. Unfortunately, the only reason I see that fits is that people are too wrapped up in their own lives too take the time to make a phone call. If they make the call, they may have to answer some questins, they may be asked to stay on the line until someone arrives... If that happens they will be late for work, or their next spa treatment, or whatever the case may be. And if that happens it's just going to throw the rest of their day off. It's disgusting. It makes me want to swear on your page again. I don't get like this on anyone else's page you know, I'm always very nice on every one else's blogs. Even funny sometimes. But it's why I come here. These are the issues that need to be put in peoples faces. These are the things we need to discuss, in all sincerity. These are the questions that NEED to be asked. Sadly, I believe if this happened to me, and it could... People would walk right by. With my appearance, and the way I walk. - I have tattoos and bad teeth, a shaggy white haired head, a gruff beard. I walk with a limp that makes me look drunk. I have aged beyond my years. I could easily pass for a homeless person, a drunkard, or a panhandler. I believe I could be in serious jeopardy. This is a sad situation, but a great post. Well done, once again. Jon, it's really really sad to think that as human beings we would have the audacity to look at a collapsed person on the street, and then based on his/her appearance, decide whether that person deserves our help or not. You see, you described yourself as possibly looking like a 'homeless, drunkard or panhandler', even if a person was, they are still human beings and in genuine need of help. It's a great shame it has come to that. I hope with all my heart that I never stop to think about the person's appearance but just continue to do what is right. I'm hoping not to get your 'goat up' (get you annoyed or angry) too much with my posts (you should see the debates/arguments at my family functions - you'd want to scream!) but as you said, 'questions need to be asked'. Thanks for you comments Jon. I'm back... This has just been eating at me since I read it. What IS wrong with people. We have a TV show here, it's called What Would YOU Do. They set up scenarios with hidden camera's and actors and televise peoples reactions to those scenarios. I don't actually watch the show very much, I feel like most of the scenarios are pretty hokey... I feel like if I walked into the scenario, I'd be like "Okay, wheres the camera... Where's John Quiones?" but every once in a while they set up something that seems pretty real. They set up a couple of different scenarios much like the one you describe. First, they used a female actress and had her lay on the side walk as if she had passed out. She had no problem getting help. Then they had a male actor do the same thing. No on approached the man. but several people did get out thier cell phones. In the final scenario they used the same male actor, but they put a beer can NEAR him, not even in his hand or anything. Just near him. It really was heartbreaking to watch. Person after person walked by him. They ONLY person that stopped to help that man was an elderly, black homeless lady. She was handicapped, and appeared to be maybe slightly mentally handicap as well. When she saw the man she went to him and tried to get a reaction from the actor. When she got none she started looking for help. She did't have a phone so she started asking passers by to call 911. Still person after person walked by. Some people actually recoiled away from the woman while she was begging for someone to help. I couldn't believe it. This woman, this hero in my book, actually went and took the beer can and threw it in the trash can, so no one would see it. And she still had to beg to get someone to dial the phone! It was a while ago that I saw this show, and I'm sure I don't have it detail by detail, but it's close enough for my recollection. It really goes to show were morality lies in today's societies. Sorry for writing my own blog posts on your page. :) But so often you bring up issues that have already plagued my mind, and it gives me the opportunity to let some feelings fly. You and your blog never fail to impress me. I'm really done this time. Jon, don't worry about the length of your comments on this blog, because you do make very valid points and it's also good to allow people to express a view rather than hold back. Sometimes when you read peoples comments, it can get you thinking on a different level, or it can actually get you to change your views on certain things, so talking it out is a great way to communicate Jon. I've no problem with it at all. The example you brought of that program brilliantly illustrates the layers of prejudice that can come into play behind people's decision to turn a blind eye and refuse help. That is bad, but it completely demonstrates what I'm so concerned about in this post. despite of cultural or moral differences, i also found that in crowded area, people seem to be less concerned about other lives, because they seem always hurrying for nothing! and in the place that are less populated, people are more friendly, more caring. Thanks Yun Yi, I'll definitely have a look at the link you sent and it's good to get a far Eastern perspective on this, but I'm sorry to hear that life in big cities seems to be the same the world over. You are so right. Even worse situation is what happened in NYC not too long ago in the subway. This man was on the tracks (anothe man pushed him) and no one helped. He was standing on the tracks - obviously trying to get up to the platform, and all he needed was one person to help him up, but not only did nobody help, but a photographer took a picture of the accident, supposedely to warn the train driver with his flash. My words might be harsh, but I really think that photographer should be sentenced to murder second degree! I was repulsed, and it makes me scared when I walk next to the track now. What if I slip? Will everyone let me die? Yes, I see your point. Sometimes people don't help in situations like this because they fear they will be seriously injured ie: electrocution, but there is no excuse why they didn't press any alarms on the train platforms etc (not sure if they have the same systems we have for emergencies). I was in Central London, with my sister.A man had fallen down, and his shoes were out of his feet.Evrybody thought he was a drunkard, and no one cared.He was having some kind of fits. We ran to his rescue, he was about 50 i think.Well dressed, some kind of office clerk.well trimmed. I was shocked about the indifference of people around him. He stays in Surrey.He is a social volunteer. He was dizzy,because he hadn't been able to eat properly, BECAUSE HE WAS TOO BUSY HELPING PEOPLE WITH PROBLEMS.He is diabetic type 2 i remember.He forgot his injection because he had meetings. And the people around, just ignore him, like a vulgar dog hit by some cars. I will stop here.Please ponder. I only want to say F***K you people.F***k you. Well, thank God that you were around at that time to help, otherwise I'd hate to think what the consequences would have been. And to think that this man used his time helping others..... need I say more. Maybe we can all continue to learn from this. Thanks Mister Potato. There was a classic example of this in a pyschology class I took...the story basically was about a woman who was stabbed and there was a bunch of people who witnessed it but nobody said anything...forgive me, I'm paraphrasing the story for the sake of length but the reason behind nobody helping was humans feel a need to mimic. Lol...nobody wanted to help because one person followed by the next felt they should keep their mouth...very similar to the guy you helped...I'm sure tons of people probably saw him but the attitude of, "I'm not doing it." Kept rearing its ugly little head. It's a bad attitude to have L.A.Green, and they might have good reason to be quiet but if they were to be stabbed I hope they would have the same policy, that everyone should keep their traps (mouths) shut. Thanks for the comment mate.